This piece was first exhibited as part of the first Impressionist Exhibition in 1874. ‘La Loge’ translates to ‘The Opera Box’, a popular subject among the more forward thinking artists of the time (other examples include those by the artist Mary Cassatt). The opera house seemed to embody all the contrasts and confusion of Parisian society at the time. While it was the place for the wealthy to see and be seen, prostitution was rife among the performers and the established upper class felt themselves increasingly infringed upon by kept mistresses and the more successful women. Renoir uses this sense of social uncertainty throughout the painting. Contemporary reviews highlight the developing difficult of making social judgements about people (perhaps particularly women), as one proclaimed the woman depicted as ‘a figure from the world of elegance’, while another cited her as a warning to young women against vanity and the fickleness of fashion. Her dress is elegant, with the strong vertical stripes which were in vogue at the time, complemented by the subtle shades of the fresh roses in her hair and within the garment. Her jewellery is lavish yet simple, a gold bracelet and a long string of pearls. To the modern viewer, it is difficult to decide whether she is dressing excessively and extravagantly, or simply abiding by the expectations of her peers. For clues to this we look to her expressions, her movements. She leans forward, resting an arm on the ledge, her fan on her lap, an air almost of excitement. Her eyes are subtle, her mouth slightly purses, it is hard to tell whether she is favourable or shy. The painting is a great interplay of gazes; where usually the viewer is the primary gaze in concern, we are the ones looking, here we become one of the great interchange of looks and expressions. The opera glasses are a clue to this, the man behind points his high, clearly not directed at the stage. We almost see ourselves as acting out the same role as him, the cropped composition suggesting we too look through the opera glasses, in a box opposite and slightly above the woman. When we view her in this context she becomes easier to read. The composition is potentially highly voyeuristic, the male depicted implies that we too are male, searching the opera house for the most pleasing woman, attending the opera under the pretence of intellectual nourishment. Alternatively we are female, and eying her up competitively. But this sense of voyeurism is countered by her gaze; she is slightly knowing, neither encouraging being viewed, nor offended by it, but gently acknowledging it, looking back at the viewer, or the other audience members, accepting this aspect of society. We feel almost as if she’s so accustomed to it (it after all occurs in her own social circle, the man she sits with) that it no longer merits a response. She becomes almost symbolic, or asst least typical, of modern woman’s experience on Paris in the 1870s. Impressionist painting is associated with the outdoors, painting ‘en plein air’ being one of their major lasting contributions to the development of art. Not only in landscape paintings, but also in the paintings of people enjoying the communal outside spaces of Paris itself, such as Renoir’s own ‘Ball at the Moulin de la Galtette’. However they were highly influenced by both the techniques and the subject matter of Manet. 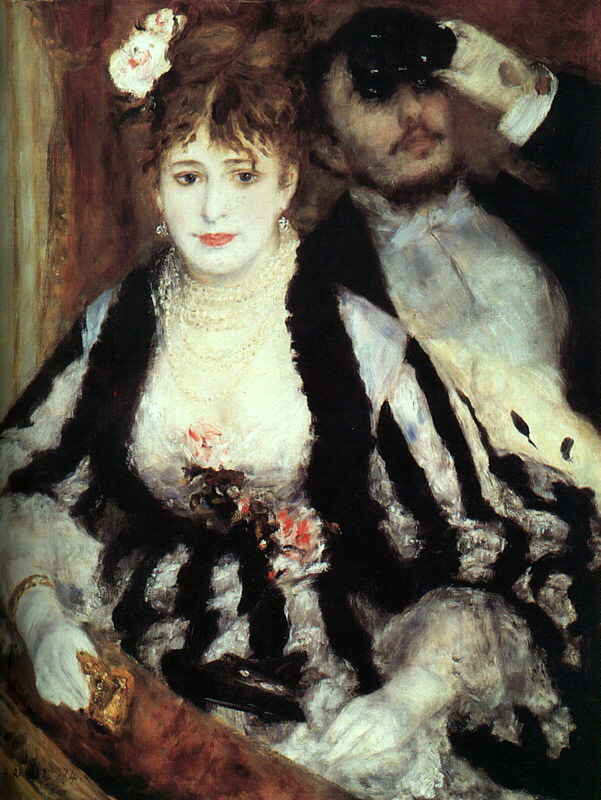 Renoir is here following Manet’s example, set by such paintings as ‘Un Bal Masque l’Opera’, painted just a year before in 1873. The strong use of black is unusual for Impressionist painting, as they thought it ineffective at depicting light, preferring brighter colours which achieved more realistic effects. Here the black is mixed with blue, to better evoke the play of light. Throughout the painting blues and yellows are used for shadowing and highlighting (respectively). The white of the dress is in many places mixed with greyish blue, to evoke the sharp contrasts of the unnatural gaslights, and the deep shadow in the recess of the box. Yellow is used most clearly on her jewellery, picking out the light reflecting on the pearls. The earrings are a highly skilful contrast of blue and yellow, with the tiniest dabs on white, giving them realistic shading while maintaining a full form from a distance. The warm yellow is appropriate for the glowing yellowish light emitted by the gaslights. This use of yellows and blues is common among the Impressionists, used for portraying a wide range of light effects, and for creating more realistic shadows, with a greater depth. Technological advances had lead to the production of chemical pigments. These were both much more readily available than their predecessors, and much cheaper. Previously pigments had largely been made from expensive natural materials, particularly blue (the most prized pigment being lapis lazuli, traditionally mined in Afghanistan). Blue is also used in ‘La Loge’ for the woman’s eyes, giving the piece a sense of unity. The Impressionists are also well known for painting ‘in front of the motif’. This is not to say that the motif was in its natural setting. The woman depicted is in fact a popular model, from Montmarte, the artist’s den quarter of Paris, Nini Lopez (flatteringly known as ‘Fish Face’). The man is posed by Renoir’s brother Edmond, who often appears in Renoir’s paintings (in ‘Ball at the Moulin de la Galette’ and twice in ‘Pont Neuf’, among others). The viewpoint is almost impossible to actually paint from (through a pair of opera glasses) so it is likely that it was staged in a studio. The brushwork however still has the exuberance of speed. They vary greatly in size; on the dress and hair we see the typical broad brushstrokes of the hog’s hair brushed favoured by the Impressionists, while the jewellery show delicate dabs of colour from a heavily loaded brush. Her face is very smoothly modelled, again shading accomplished through gentle touches of yellow and blue, and a slight flush brought by pink strokes on her cheeks and chin. Taking a cynical viewpoint, this smoothness could be to represent the over-use of make-up by some sections of society at the time (one section in Baudelaire’s ‘The Painter of Modern Life’, is entitled ‘In Praise of Cosmetics’, in which he argues that make-up should be used and is honourable for its attempt to improve on Nature, and is a piece of writing which can help to inform us about attitudes towards make-up). On a more optimistic note, the paleness of her skin well suits her fair hair, and draws pleasing comparison with the flowers in her hair and bodice. Edmond Renoir is stylishly dressed, with his crisp white shirt and gloves, he fits well with the characteristics of a flanneur. We are also left to guess as to the relationship between the two figures. Lovers, customer and client, brother and sister, we cannot tell. The cropped composition prevents us from being able to see the entire box, so we do not even know if they are alone or part of a larger group. This ambiguity is fitting to the social setting. As we are looking at her across the open space of the opera house, we are put in the position of the stranger. She may be famed, or we may only sport her for her looks. But she is enigmatic, mysterious to us. Her knowing look acknowledges the action of us looking at her, whilst also maintaining this sense of aloofness; she is almost protecting her identity from us. Renoir presents us with all the intricacies of social interaction within a single painting. The balance between what we can learn from simply looking at her and what we cannot know, what is concealed from us or mysterious, is carefully maintained. This provokes the question of ‘why?’ Why did he go to such lengths to recreate an experience which any relatively well-heeled Parisian could encounter on a daily basis? This is where the painting takes on a gently confrontational element. He questions his audience as to why they do this; if ultimately all they can learns is how fashionable someone is, and some superficial hints as to their character, what is the point of eyeing each other up like this? So she is fashionably, she wears fine clothes and jewellery; this could be inherited money, or gifts, this could be some fleeting moment in a life raised from poverty (see the ups and downs of Nana, in Zola’s novel of the same name, which inspired Manet to paint a portrait of the fictional woman), or she could be from a fine old family with wealth accumulated over years. We cannot really learn much about her. By preserving this moment in painting, Renoir implies another reading. This moment of the woman viewed by the most likely male audience member, suggests that he also intends for us to empathise with the woman. She takes up the majority of the picture space, yet (without meaning to imply that Renoir was some level of proto-Feminist) our gaze almost reduces her to an object within the space. He encourages us to consider her perspective on the situation, and question whether we would accept it with such docile knowingness as she would. ‘We’ in this case can be taken as the male majority of Renoir’s audience. This sense of questioning gives Renoir’s painting a stronger link with Manet’s ideals than many other Impressionist paintings, including many of his own. The woman is distinctly of her time, and yet not. She can mean as much to the modern woman, caught between the desire to be appealing and the post feminist expectation to be disdainful of the male gaze; we can see just as much of ourselves in her. Renoir has created an icon of the conflicting demands of society on women, not only of his own time, but also of ours. I found your comments to be informative and perspicacious. Thanks. You have an informed eye for detail — both pictorial and historical. And you are adept at saying what you see and know. Having seen this painting in person, for me the “magic” was backing away step-by-step until Renoir’s brushstrokes became “real” velvet and satin. It happens with many another good artist, too, of course — John Singer Sargent’s watercolors, for instance. Something as an art historian and art aficionado you know already. Best wishes. I feel the woman is insecure, she is feeling vulnerable that despite all her finery, her male companion is looking further afield, behind her back, though she is aware of his focus being elsewhere. Yes, she may be a courtesan, but she looks more girlish than worldly, and perhaps is melancholy at the state of things. I think she’s aware of her role as an social ornament and has accepted it—may even be promoting it, but the lips, roses, and eyes say there’s passion inside of her that her fellow socialites, especially the man in the background, will never see or appreciate. Very interesting post along with its companion “Feminist Re-Interpretation”. I really enjoyed reading your blog while I had to research Renoir’s La Loge for my art course. This painting is really full of layers when you start looking at it closely. I found a fascinating parallel between the opera glasses of the Impressionist time and the social media of our time…I have put it on my blog https://reinventingrid.wordpress.com if you’d like to check it out.